Executing consistently under pressure in a kitchen as open as this is not for the faint of heart. 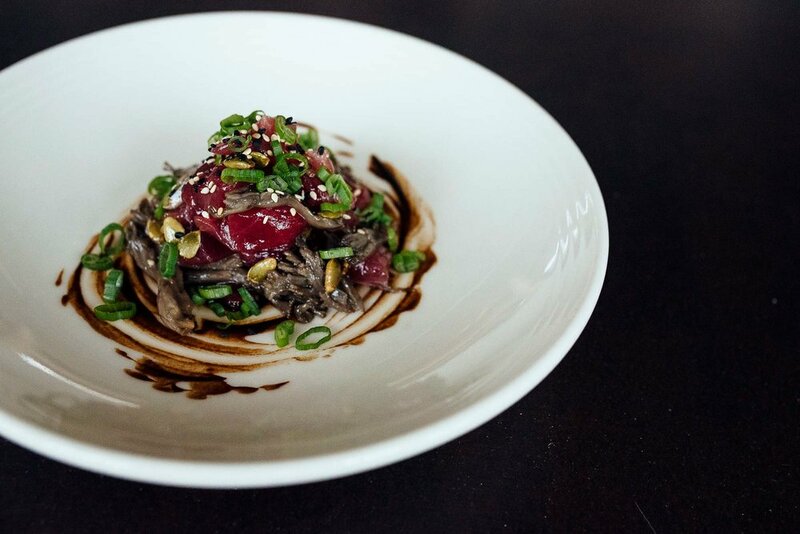 Maitake mushroom confit gives a perfect balance of texture and earthiness to the pristine tuna tartare. In the case of most restaurateurs who have achieved iconic status over the past 25 years, while radically reinventing the dining landscape of the city, there usually exists a somewhat hands-off approach to their current and new businesses. Over the years, they have delegated a vast majority of the responsibilities to trusted staff and take advantage of being able to rest—both on their laurels and literally. Dana Street is not most restaurateurs. A simple dredge of cornstarch before deep-frying helps to impart a crispy texture while not sacrificing any of the flavors of the fish. Pictured alongside their decadent short rib pot roast, a wintertime staple. Scales actually saw its first iteration back in the days of the ill-fated Portland Public Market, where at the time they were among the few serving an elevated version of classic Maine fare that showcased the results of keeping the process simple while employing much better ingredients. The market closed in 2006, but as early as 2005, Street had begun setting his sights on a new potential venue for Scales. However, due to the restaurant climate at the time, the project was shelved until being resurrected around 2014. The corrugated steel–sided building with no windows, suspended over the water, needed about every renovation imaginable, and Street was involved in nearly every decision, no matter how seemingly mundane. Anyone who dined at Scales during its opening months of early 2016 witnessed a work in progress, the product of Street’s continual tweaking to get things exactly the way he wanted them. The walls didn’t seem to be finished, some tables had tablecloths whereas others did not, and even the style of service felt like an experiment in the process. The menu appeared to be locked in a struggle with itself over whether it wanted to be referred to as a “Seafood Restaurant” or not. “The one thing that has been consistent from day one,” says general manager Michael Burke, “is that Dana does not want Scales to be a nautical-themed restaurant in any way, shape, or form.” The aesthetic is actually quite modern, with streamlined fixtures and a radiant heat concrete floor—stamped to resemble wood—accentuating the impressive windowpanes running the length of the dining room. The seafood stew is a permanent menu fixture that is the brainchild of both Eliot and Olson, combining classical and modern technique to showcase the quality of the components. As it enters its fourth year in operation, Scales has found a niche and an identity as what Street refers to as a “New England brasserie.” Several months after the opening, Fred Eliot and Travis Olson were promoted from sous- to co-executive chefs—a brilliant move that ensures the head of the kitchen will always be there, any day of the week. The menu would still be anchored by dishes like New England clam chowder, fresh Maine oysters, and whole lobster—with diners presented the option of enjoying them steamed or roasted—because at the end of the day, it’s still a restaurant directly on the harbor in Portland’s Old Port. This being said, classics, such as baked haddock, are augmented with black trumpet mushrooms, fingerling potatoes, leeks, and a delicate fumet cream. As with all of Street’s restaurants, the array of seafood at Scales relies heavily on George Parr of Upstream Trucking, and though the selection can rotate based on seasonality, certain staples—cod, halibut, and octopus, to name a few—remain permanent fixtures on the menu even in regard to preparation. Some dishes have achieved this status from much tinkering, such as the Seafood Stew. Beginning with traditional French elements such as a rich tomato broth scented with Pernod, the chefs collectively brainstormed more unorthodox additions such as pancetta, shishito pepper, and guajillo chili until dialing in a formula that would become a signature staple of the restaurant. Maine scallop carpaccio is not only beautiful but also the perfect contrast of sweet, buttery, tangy, and salty. Eliot’s background in French cookery goes back to his childhood, where he would often accompany his mother to the markets in Paris on Wednesday (there is no school in France on Wednesday), visiting the butcher, fishmonger, baker, and charcutier to stock up for the week. On weekends, he would visit his grandmother at her farm in Normandy, where he would observe her slaughtering rabbits and chickens, and developed a taste for unpasteurized milk and butter. These influences show up throughout the menu in the form of elaborate specials like Lievre a la Royale, a whole braised rabbit served in blood sauce, as well as what could be considered Eliot’s specialty, Pâté en Croute, encased with an elaborately decorated, perfectly burnished shell of pastry crust. In addition to these, a consistent offering like Short Rib Pot Roast is basically a more decadent incarnation of beef bourguignon. An unlikely standout is the bread offerings, served a la carte to really allow them to shine rather than become the ubiquitous, one-dimensional basket brought to the table upon arrival. The views through the massive windowpanes serve as a reminder that one is, in fact, dining while suspended over the waterfront. “We focused on styles rooted in the New England yeast-bread traditions,” Olson says, “rather than old-school hearth bread.” This means soft, chewy Cloverleaf Rolls served warm with herb butter, skillet cornbread, and one of the most excellent Anadama slices I have ever had the pleasure of tasting. Made with molasses, cornmeal, and rye, it is topped with a generous slab of butter right out of the oven, immediately after which it goes back in just long enough for the butter to start to melt but still retain a bit of texture. It is finished with a drizzle of molasses. The responsibility of composing a wine list that will span the breadth of the offerings at Scales landed firmly in Burke’s lap, as he is a longtime veteran of the wine business who at this point understands Street’s particular tastes—an aversion to high-alcohol, new-oaked wines, for example. He sought to strike a balance between those who prefer the style mentioned above—classic, Old World wines from regions like Burgundy, Alsace, and Piedmont—and those who prefer the ripe, modern flavor profiles that are too popular to overlook in today’s market. Those looking to nerd out a bit can often explore off-menu bottles such as a 1995 Caves Sao Joao Poco do Lobo from Portugal, not only an excellent value but also a rare opportunity to taste wines with considerable age on them. Desserts at Scales, overseen by pastry chef Nicole Smulski, embody much of the same philosophy as the savory menu. There are staple dishes, such as a continually refined Indian Pudding with fruit compote, boiled cider, and rum cream, as well as a consistent selection of frappes, sorbet, and frozen custard (chosen for its richer texture from the addition of egg yolks). A recent visit during the holidays found me enjoying a delicious, beautifully plated Bouche Noel. Although it opened to much fanfare, Scales, like virtually every other great restaurant in the world, gradually hit its stride throughout its first year. Timing was coordinated, service was simplified, and the menu navigated to the proper course. 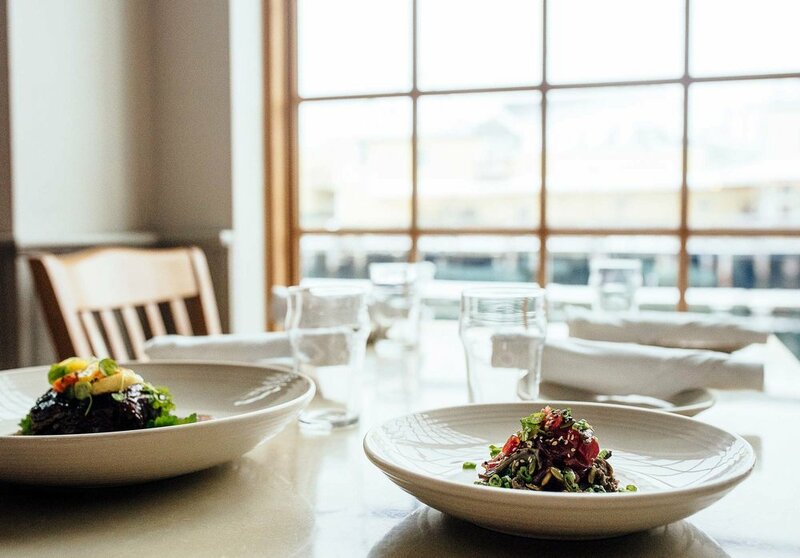 Now, dwarfing most eateries in the state and serving as many as 400–500 guests a night during peak season, Scales has established itself as a real destination restaurant in a town where that is no small feat.